Sometimes I forget to talk about accessories, like covers for example. IBC just made a custom cover for a customer’s brand new 2014 Zodiac Bayrunner 500 and this time I remembered to take a picture. 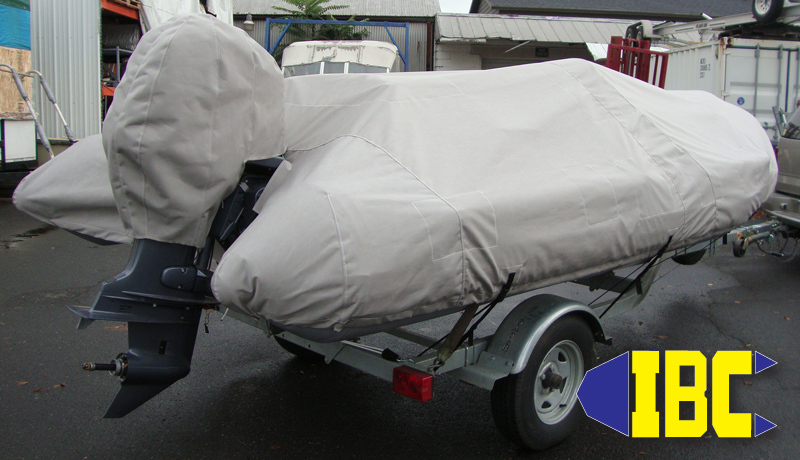 The cover is used for storage on the trailer,trailering down the road,and as a mooring cover. Utilizing performance marine and Sunbrella Fabrics in most colors to match your yacht IBC will have your cover made to fit with critical area reinforcing as standard. Trailering loops? Yes they are there! Cinch cord? Yep, included as standard. 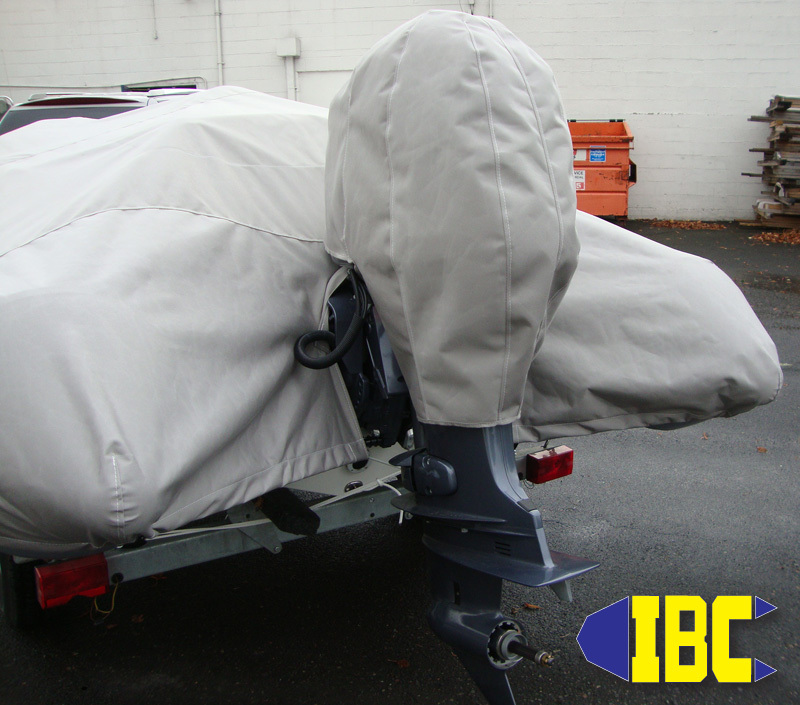 IBC has gained exceptional insight through years of inflatable boat customization and rigging to make the process of custom covering quick,easy and inexpensive. Give us a call (503)235-2628 and we’ll get you covered! For Standard Inflatable Boat Covers Click Here or visit www.inflatableboats.com and shop securely with our online store. IBC just got in a shipment of BIG R.I.B.s, all 2014 models just in time for the BIG R.I.B. Cook Out! Get em while they’re hot and save the headache of trying to get one in peak season when nothing but boating will do. Fun for the family, fun for the professionals, just plain fun! Pro open Models for the diver or water worker looking for the edge of tech and performance in a all around boat. Bayrunner Models for the best of both worlds, luxury seating and performance in an open boat price range. Hurry these beauties won’t last long. Everyday I’m forced to give a a speil on Hypalon (CSM) or PVC as a material choice when purchasing a new inflatable boat. Many forums and sites will have users saying Hypalon is the only choice for inflatable boats and how bad their experiances were with PVC. Well as a lifetime sailing around this big blue marble of ours has taught me there are benefits to both. Most of the “issues” I hear about or see with PVC can be attributed to the boaters themselves. Lack of maintenence, and neglect is 99.9% of the time the culprit in the failure modality. Under inflation seems to be the front runner in all problems with either of the boat materials with a strong second place showing from neglect. You’ve spent the money now take some responsibility and take care of your investment. It’s easy to shift blame to the manufacturer for something you had control over. The question of Hypalon being glued is one of merit, the passing grade for a hypalon boat is 15% air loss over 24 hrs (factory acceptable) even in a new boat, for PVC it’s <7% in 24 hours. If a PVC boat loses 7% in 24 hours we find the leak. I have owned both and can tell you I've had to put air in both over the course of a day, but usually less in a PVC boat. I often have to suffer the indignity of the "No Wake Zone" and as I putt thru I always see dinghys languishing on the back of yachts both in PVC and Hypalon both under inflated and floppy. As stated above the #1 failure modality is under inflation, so take a minute and top off. Changing weather and temps will play a role on pressure, it's obvious but overlooked. When I put the inflatable boat in the water in the afternoon I run hard and fast charging everywhere. When the sun goes down I notice a performance fall off regardless of type of material used. This can be attributed to temperture variance. Time to break out the foot pump, top off, and rally home! My current inflatable boat is PVC and I haven't had to put air in it once this whole season. What do I do different? I put air in it at the right pressure to begin with that's all. Now the nuts and bolts of it all Hypalon is actually dead, Dupont stopped making it in 2010 so anything else is a substitute for all of the holdout yachtsmen. (it's called neoprene/csm now) Hypalon is a glued construction that requires scuffing in order to make the seam stick and be airtight (all hypalon boats leak down) Hypalon is slightly more UV tolerant than PVC but resists hydocarbons much better depending on the type or grade. (when's the last time you sailed in a sea of acetone?) 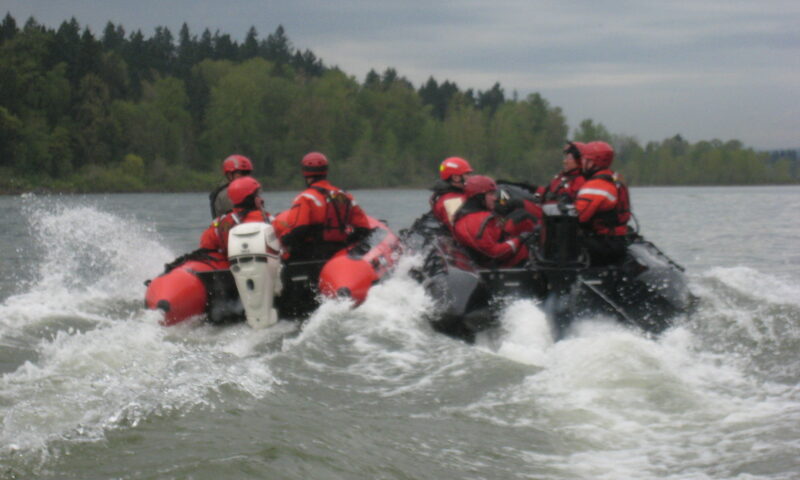 Military Hypalon boats are Hypalon coated Neoprene and are much heavier weight materials than recreational lines so no comparison can be made between the the two or PVC. (military inflatable boats are decommed after 2-5 years so the point is moot) Hypalon will oxidize and break down in UV and oxygen, some types/grades are better than others. (diamond reverts to graphite and CO2 in UV radiation even they aren't forever) Hypalon is more expensive because it's more labor intensive as it has to be scuffed and glued by hand, we have to pay people a living wage it seems. PVC has come a long way but of note the "V" aspect or vinyl is the same stuff as old records and will last over 100 years. PVC boats are both welded or glued, with the second process being a chemical weld when done correctly, and a welded seem doesn't fall apart in the sun 99% of all inflatable boats are made of PVC or in Zodiac's case Strongan (trademarked) material. Modern PVC is UV stabilized and with protectants that block 100% UVA and UVB radiation that point is no longer valid in today's age. PVC patches much easier than Hypalon despite what you read from part time wanna be boaters posting their all knowingness on the web. PVC boats have the same warranty as the Hypalon boats so buy a reputable brand in either case and get what you pay for. Military usage of inflatables is more than Hypalon, I operated on both types when I was active in the US Navy that's a false argument too. Zodiac makes boats out of both materials and have over 100 years in the game, they aren't a fly by night Chinese manufacturer with a here today gone tomorrow business plan. Buy a brand name you'll be glad you did later on. People say Avon is the best (owned by Zodiac), or Bombard (also owned by Zodiac) so go where your eye takes you and get something worth owning from any of the top three and rest easy that your decision was sound. Other brands often use lesser stuff to make the boat that much cheaper and attractive, when it comes time to shell out boat units (money) do your homework. The people at the shop here use both types,it's about 50/50, but as far as I know they have no favorites because they all keep enough air in them to prevent problems. Bottom line to prevent snags,punctures,delaminations,and seam leaks keep air in the boat no matter what it's made of. If you're too lazy to do basic care and cleaning remember, we offer a full service repair department that is more than happy to fix old floppy for you.